Here’s a super simple and fun Christmas craft for kids. Santa’s reindeer work up quite an appetite while delivering gifts on Christmas Eve. After all, it’s hard work pulling that sleigh through the sky! So why not help them out with a little snack they can enjoy while Santa Claus is inside delivering gifts? 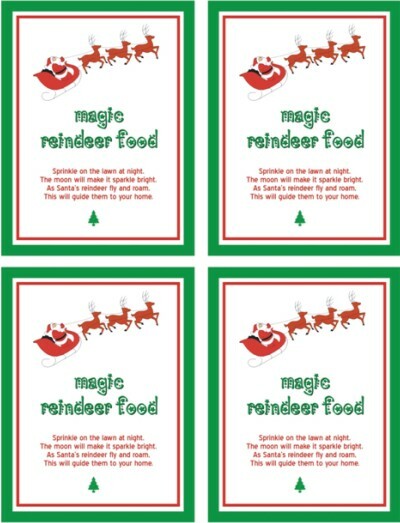 Kids will love making this magic reindeer food, and it’s so easy, it only takes a few minutes. Sprinkle on the lawn at night. The moon will make it sparkle bright. This will guide them to your home. The page contains four printable images, so you can create several bags or tins to give to friends and family. Then save your reindeer food and sprinkle it outside before going to bed on Christmas Eve. It will ensure Santa finds him way to your home before Christmas morning!